Most parents remember doing homework when they were children. Are group homework assignments a bad idea? Who actually writes homework assignments? What is the ten-minute rule? How much time do students actually spend on homework? Do Asian students tend to do more homework? How is technology changing homework? How does homework affect homeless students? What is a Student Information System? Many think of homework as a student's job, or as a rite of passage that keeps them out of trouble. Or as a certainty of life, like death and taxes. Of course, there's a lot more to homework than mere tradition. Homework is a big part of the educational experience. The main idea behind most homework is to spur students to practice. Learning anything takes time, and classroom time in school is limited. Students only spend about six hours per day at school. Each year of school, students spend about 1,000 hours under the supervision of school staff. Some of those hours are instructional, and some aren't. Homework offers a way to expand the time students spend learning. In early elementary grades, practice is essential for students to learn to read and write. Of course, it helps a lot for students to want to practice. Just going through the motions can hurt more than it helps, especially if it interferes with students' motivation to learn. Ineffective, repetitive practice is often given a pejorative name: "drill and kill." Good homework assignments give students just the right challenges to practice skills and absorb more learning. It's difficult and time-consuming work to design good homework, which is why most teachers don't do it. Instead, they usually rely on professionally-written course material, usually selected in consultation with administrators and other teachers. Another commonly-mentioned purpose of homework is to prepare students for the expectations of the workplace. The teacher, in the role of the customer or supervisor, assigns work and judges its value and timeliness. This model applies most directly to longer-term projects such as essays or lab reports. To prepare students for even more complex, real-world work, teachers sometimes design group homework projects. Such assignments offer significant opportunities to develop interpersonal communication and organizational skills, quite apart from the academic content of a class. There are many approaches to grading group homework projects, and teachers must select among them thoughtfully. How Much Time Should Students Spend on Homework? Obviously, students will learn more if they spend more time learning, all other things being equal. But not all homework time is of equal value, and there's such a thing as too much. In some schools -- especially high schools -- homework expectations can be downright unhealthy. If you are looking for ways to have a conversation about reducing the academic pressure in your school, you may find inspiration in presentations available on ChallengeSuccess.org. It's reasonable for parents and students to ask "how long is homework supposed to take?" Schools and parents need some guidelines. The "ten-minute rule" is endorsed by both the National PTA and the National Education Association. It states that "the maximum amount of homework (all subjects combined) should not exceed 10 minutes per grade level per night." The 10-minute rule evolved from a synthesis of many research studies about homework, originally conducted by Harris Cooper of Duke University in the 1980s. It is called a "rule" largely because many schools and districts include a version of it in their homework policies. If taken literally, the "ten minute rule" implies that sixth graders should spend no more than an hour per day on homework. As usual, the actual findings of research about homework warrant no such precision. From the start, the "rule" has been better imagined as encouragement for teachers to be thoughtful about what they ask of students. In higher grades, particularly, it is easy for teachers to collectively bury students in homework without even knowing that they are doing it. In most schools, few students come anywhere close to busting the 10-minute rule. The amount of time students spend on homework per week varies, too. 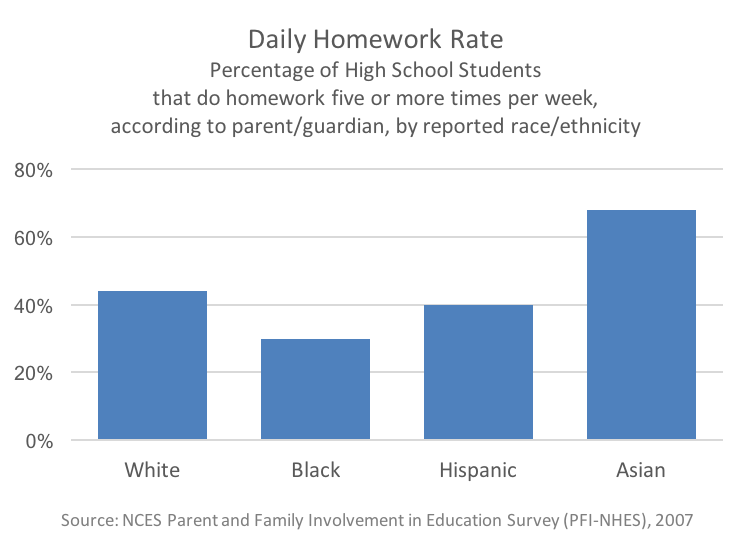 White, black, and Hispanic parents in this select survey responded that their high school children spend between six and seven hours per week on homework; for Asian parents, the reported average was over ten. In the old days, teachers wrote homework assignments on a blackboard, or handed them out on paper. Students would copy the assignment into a notebook, then bring it home, then do the work, then bring it back to school, find it and hand it in. There were many points of potential failure in that chain of actions, and few ways for parents to support success. The only way for parents to know whether homework was getting done was to get in touch with a teacher personally. In plenty of schools, this process hasn't changed yet -- but it will. Increasingly, teachers are using online tools to assign homework, track completion and record grades. Using these student information systems, students and parents can see homework assignments and deadlines online and with little or no delay. They can tell when work has been handed in, and what score they received. If your school district doesn't yet use a school information system, it may be evaluating one. Is Homework Bad for Family Relationships? Because homework is such an important part of the education process, the California State PTA offers homework advice for parents in many languages. The National PTA has advice for teachers, too: Homework that cannot be done without help is not good homework. An influential critic of America's education system, Alfie Kohn, takes it even farther. He questions whether homework is worth assigning at all. In part, Kohn argues that homework can easily become an unhealthy center of focus in the relationship between students and their parents. Flipping: What if Homework Isn't Practice? Classically, teachers introduce new ideas and skills in class, lecture-style. Homework time is for practice, not for new stuff. But there are exceptions. For example, teachers sometimes ask students to read assigned material on their own before discussing it in class. When they do this, they are turning the time use model upside down. In the past, this approach was mostly reserved for upper-grade-level work in English or History classes. But the increasing availability of computing power and internet connectivity is making some pretty amazing explanations available online in all kinds of subjects. Watching some lectures hardly feels like homework. For example, it might be hard for many students to slog through a written overview of the history of Japan, but if the lesson is animated, irreverent and short, it turns out that tens of millions will watch it just for fun. The practice of using technology to introduce new material as homework and using class time to discuss or practice it is sometimes called flipping the classroom. The greatest champion of this approach is Sal Khan, the founder of Khan Academy. If some students take longer, so what? Khan's core idea is far more disruptive than merely flipping the classroom. He argues that in a world where online learning can allow each student to learn at their own pace, schools should fundamentally rethink their whole approach. What's the point of giving a student a low grade? Does it really help? Given the time and support they need, any student can master any subject. If some students take longer, so what? Teachers should focus on getting each student to mastery before moving on, he argues, rather than piling new material onto a shaky foundation. In this imagining, the definition of school time and homework time blends almost beyond recognition. Putting this approach into practice isn't easy, but there are some important examples of success. For example, Rocketship Education, an organization of charter schools, has used blended learning in its schools since 2007. The results have been impressive, but "flipping" the classroom is only part of the story. As usual, no single change, on its own, produces magical results. The premise of this lesson so far has been that homework is mostly for practice. But this isn't quite true, is it? Homework counts. Students who don't consistently turn in good homework may not get good grades, even if they understand the material thoroughly. That's a higher bar for some students than for others. Some have good places to study, encouragement and support from family, and help when they need it. Others don't. What does "home" work mean for the more than 200,000 students in California who are homeless? Homework is an everyday activity, so everyday advantages add up. To mitigate these inequities, some schools modify their homework policies. Students with specific learning challenges (like dyslexia, dysgraphia or ADHD) can have a particularly hard time keeping up with everyday homework. The U.S. Rehabilitation Act of 1973, section 504, established that in order to ensure individual students with a disability are treated fairly in school, teachers may modify course work, including homework assignments, to better suit their learning needs. Students that qualify for "accommodations" under section 504 may be entitled to have class and homework plans modified, in consultation with parents. Students receiving special education services defined in an Individual Education Program (IEP) may also require homework accommodations or modifications. Thanks to Giulia Gomes for assistance with research on this topic. This is a great question. I wouldn't ever look at expressing concerns about homework as undermining a teacher, especially if the teacher is approached in an appropriate way. Unfortunately, often parents sound unnecessarily accusatory (e.g. You assign too much homework!!) First, I would ask the teacher how long your child should be spending on the assigned homework. They may be surprised that it takes your child an hour to complete. I have had teachers say that only a specific amount of time should be spent each day on homework--anything that doesn't get finished just doesn't get finished (this was true in the lower grades). However, sometimes if homework is taking longer than anticipated, it can be a sign that what was taught in class didn't sink in. This is also important information for the teacher to know. Most teachers I've worked with appreciate parents who are proactive and engaged with their child's schoolwork. My teacher sets much more than the 10 minute rule. 20 minutes reading plus a math page plus other assignments - for 2nd grade. It takes us an hour. How does a parent express concerns about there being too much without undermining the teacher? There are pros and cons to homework as you outline. Here is one point to consider. Corporations conduct training. These often last for a day or two up to a week or so. There is no homework during these sessions and the "student" is often familiar with the content. Take school where much of the content is new in the sense it is building upon prior content. This takes energy and focus beyond the average corporate job. Many adults would not be capable or even quit their jobs if they had to expend the amount of energy every work day to learn a bunch of new content and have homework piled on top of that. Companies do not expect their employees to do homework. How is that different than kids?